Marketing is all about strategy (direction of application of resources and efforts) and plodding in the direction of strategy. Along the way, one has to take cues continuously and keep making decisions to ensure the results are in line with expectancies or matches the potential. ROI (return on investment) and SWOT analysis (Strengths, Weakness, Opportunities and Threats) need to be continuously applied - to ensure that marketing is viable and successful. Brands have two vital dimensions: functional value and aspirational value. Ideally, brand building through various communication avenues and other marketing approaches ought to build these two values of the brand (with the help of opinion builders too). An interesting marketing campaign currently on, is the SUN IS GOOD campaign wherein sportspersons and high profile hobby sports people, both being opinion builders, are strengthening sporting behavior/sports participation in Bangaloreans - encouraging people to go out and play... for health and fun. The use of opinion builders in this radio spot campaign (likes of Leander Paes the tennis player are supporting this campaign) who are endorsing this campaign, is giving a fillip to the campaign, adding to the functional value and aspirational value of this theme/event: play in the sun and sun is good! Based on the marketing setup (and doing SWOT analysis), one can always ideate products and its promotion. For instance, if you are a healthcare company which services patients, pharmacists, doctors and other end users: a viable idea can be BODY SPRAY FOR DIABETICS (and prediabetics) & people with certain medical conditions. There are estimated 12 crore (120 million) prediabetics and diabetics in India. This non-communicable lifestyle disease is increasingly being diagnosed in India. Products for management of diabetes (hyperglycemia: high blood sugar) and diabetic complications are always in demand. Diabetes causes various problems: increased sweating (can also happen due to low blood sugar in diabetics), skin allergies, friable skin ... Uncontrolled diabetes can cause a typical unpleasant body odour. Antidepressants can cause bad body odour. Thyroid disease (the new "epidemic") along with diabetes causes increased sweating and bad body smell. Scientists have discovered acetone like smell in diabetic sweat and breath. All this points to an emerging requirement, a need, a desire ... in diabetic consumers to have a product (body spray) that helps refresh body odour and boost confidence ... for the feel good factor. 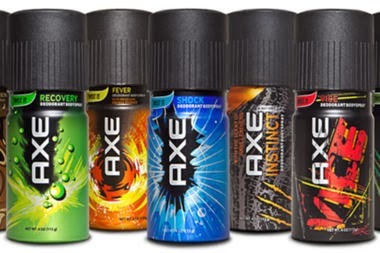 a) either promote existing body sprays to such special consumer segments (who have underlying medical conditions like diabetes, thyroid disease etc): however, it may blur the product imagery (for eg., Axe spray for diabetics...could cause a problem for the main promotional plank, theme and imagery of Axe, so it is not advisable). b) formulate an exciting refreshing brand with positive imagery for such prospects suffering medical conditions ... who wish to feel good to overcome the effect of underlying medical problems. The approach 'b' seems more appropriate, the product can be so formulated to include mild antiseptics like chlorhexidine or creosote along with good smelling ingredients and appropriately branded with sufficient marketing brand name potency: Smelgood is a nice interesting name?! A body spray to boost feeling of well-being in diabetics/thyroid disease patients/subjects with fevers/menopausal women who suffer hot flashes and excessive sweating/people with other medical conditions. Like any new product, the take-off will not happen overnight, the sale will get built up step-by-step as more and more endorsements, recommendations, prescriptions and word-of-mouth happens. There is a scope... for the daring entrepreneur to capitalize on, improve the lives of people - make profits too! Thanks for reading this blog post, kindly scroll down to read all other posts (feel free to recommend my blog to your acquaintances).